For many generations of sports fans around the country, the passage of spring means the dawning of another baseball season. The crack of the bat, the roar of the crowd, the sweet aroma of popcorn and peanuts in the air, all bring us to realize that America's favorite past time is upon us. It's a time when many of us, both young and old, look forward to seeing their favorite players in person, trying to get an autograph or just shake their hand. In the Tri-State area, the rites of baseball was very strong almost 90 years ago, when Minor League Baseball first appeared in the area. 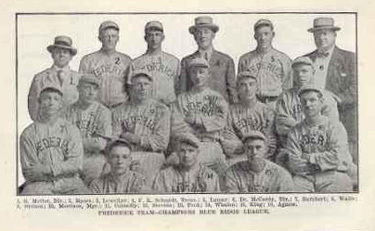 A semi-pro baseball league had started around 1907 or 1908, called the Sunset League, which included teams from Hagerstown and Frederick. The league featured several future Major Leaguers, including a pitcher named Paul Wachtel, who grew up in nearby Myersville. The Sunset League, which got its name because the games were played in the late afternoon and lasted until the sun had set into darkness, lasted until 1911, when the league disbanded. In 1914, the semi-pro Tri-City League was formed, featuring three teams from Hagerstown, Frederick and Martinsburg, WV. This league paved the way for would become the original Blue Ridge League. During the fall of 1914, plans were underway to try and form a professional baseball league featuring teams that lined the Blue Ridge Mountains, from Western Maryland, South Central Pennsylvania, and the Panhandle of West Virginia. The National Commission (now known as National Association of Professional Baseball Leagues or NAPBL), the governing body of all of professional baseball, had required that any new league have a minimum of six teams to be considered in applying for membership. Under the organization of Charles H. Boyer of Hagerstown, and the guidance of Frank K. Schmidt of Frederick, and Max von Schlagel of Martinsburg, the new league was established. Boyer, who also owned the Hagerstown club at the time, was named president of the fledgling league. After securing franchises in Chambersburg, PA and Gettysburg, PA, the league looked liked it would take shape in time for the 1915 baseball season. In March of 1915, Hanover, PA was added as the sixth franchise, and the league applied for and was accepted for admission by National Commission President, John K. Tener. The league was placed on the Class D level, the lowest level in professional baseball at the time, and was called the Blue Ridge League. While everything was falling into place for the rest of the league, Boyer's Hagerstown franchise faced some turmoil less than a month before the season was scheduled to open on May 27. Boyer's team had played at the Hagerstown Fairgrounds in 1914, and had planned to play there again the next season, but the Fairgrounds board raised the lease for them to play from $100 to $350 for the season. Boyer balked at the increase, saying the new rate was too cost prohibitive for his club to operate. Without a place to play, it looked awkward that the city that spearheaded the drive to get the new league would be the only one without a home field. With just over three weeks until the first opening day, Boyer's fears were settled when a man named Bester donated a tract of land off South Potomac Street to be used as a ball field for the Hagerstown club. Two weeks later, the making of the new field was laid out, and the wooden bleachers and grandstand were in the process of being built. By the time that Boyer's club, named the Blues, played their first home game on May 28, they were in their new ballpark, named Willow Lane Park. The 1915 season was comprised of an 80-game schedule. Since Boyer was from Hagerstown, the league office was based in the Hub City, which is where it stayed throughout the duration of the league's existence until 1930. 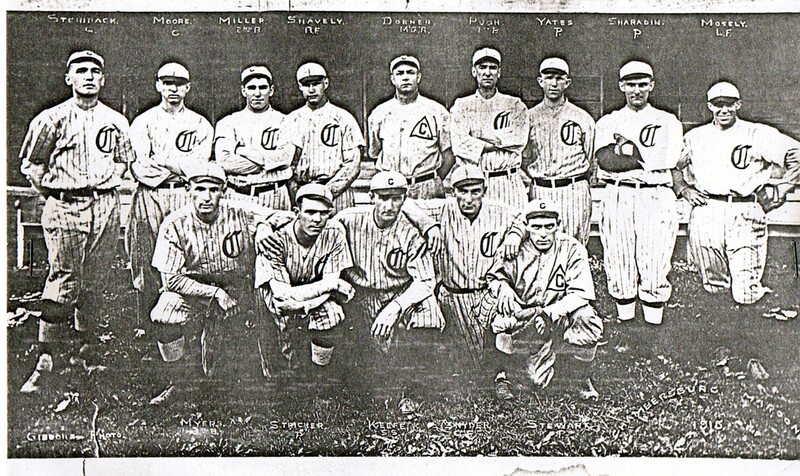 The original Class D, Blue Ridge League featured the following clubs and managers: Hagerstown Blues (Joe Laughlin, Eugene Hanks), Frederick Hustlers (Jack Morrison), Martinsburg Champions (William "Country" Morris), Chambersburg Maroons (George Stroh, Bill Clay and Gus Dorner), Hanover Hornets (Bill Starr), and Gettysburg Patriots (Ira Plank). That first season was a memorable one for the league, as it brought new excitement to the region, despite the threat of war over in Europe. Baseball in these towns, which overlooked the Blue Ridge Mountains, was a chance for their fans to root for something that was their very own. Even for a brief moment, it offered them an opportunity for them to forget about the disruption overseas that was threatening their peace and harmony back in the United States, and enjoy America's favorite sport: baseball. Rivalries began to take shape throughout the league. The fans of the three Tri-City League teams: Hagerstown, Martinsburg and Frederick had already established a rivalry between those clubs, but the addition of the three Pennsylvania teams added to the hometown excitement. The league went through its growing pains during their first season. Boyer and the club representatives voted before the season to set a salary cap for each club. Based on a 13-man roster after June 1, which included a player-manager, each club was limited to spend $800 a month on the entire team's salaries. Though the idea was a good one, a couple of club's found a way to work around the league-wide cap, which would become a controversy around the circuit during the league's early years. Each individual club signed and paid for their own players. Since there was no agreement with any Major League clubs at that time, each club was free to run their operation the way they wanted to. Two Major League clubs, Connie Mack's Philadelphia Athletics, and Clark Griffith's Washington Nationals, sent several players to play in the league during its first few years. During that first year, there were no restrictions placed on how much experience a player had before playing in the Blue Ridge League. There was no farm system, and all the players were, in effect, "free agents," so it wasn't uncommon to find a few players with Major League experience sprinkled among the rosters in the league. Among them were pitchers Dolly Gray and Gus Dorner, and outfielder Bill Clay, who played briefly for the Chambersburg club. What became a controversy, was how a few of them were paid. The players were paid an average of $50.00 per month, while some of the better players, including the player-managers were paid between $75.00 to $125.00 monthly during the course of the season. Though all the clubs stayed within the salary cap, there was nothing in the rules that stated a Major League club could pay part of a player's monthly salary. Such was the case of shortstop Tom Connelly. An infielder, Connelly started the 1915 season at the Major League level with Griffith's Washington club. When Griffith had no room to keep Connelly on his roster, he worked out an agreement with the Frederick club to send his player to the Blue Ridge League to get more playing time. Though the Frederick club paid Connelly only $50 per month for his services to stay within the cap, what was not reported was that Griffith paid the same player $200 per month at the same time. This did not sit well with the other sportswriters and clubs around the league, but because of a loophole in the rules, League President Boyer could do nothing about it at the time. Connelly was a key player for the Hustlers the last month of the season, which added to the rumor mill, but ironically, he never played in the Major Leagues again. Nixon Field, located on the campus at Gettysburg College, had no outfield fence, or barriers to keep the fans from rushing on to the field, which happened frequently that first season. Since parking was limited, it was not uncommon for at least a dozen automobiles to be lined up along the outfield grass to watch the game. The autos became an obstacle for a few outfielders, especially when the ball would roll underneath one of the vehicles after a deep drive to the corners of the field. Frederick's home field was at the Fairgrounds, which included cow barns in the leftfield. Like most of the other ballparks of its time, it featured a wooden grandstand, but along the foul line areas, there were few barriers, like rope or chicken wire, to keep the fans from going onto the field to get a closer look. Only Martinsburg and Frederick's ballpark had any type of outfield fencing that designated a home run that first season, which was a sharp contrast to Chambersburg's Wolf Park, which was a converted corn field during the summer. They played their home games at Agricultural Park on the Frederick Fairgrounds; Nixon Field at Gettysburg College; and McAllister Field in Hanover. Martinsburg played at Rosemont Park, while Hagerstown played in at Willow Lane Park (now Bester Elementary). Unfortunately, none of the original structures are still standing; the memories of the games and the men who played in them are gone. That first season saw the Frederick Hustlers take the league by storm, as they won fourteen of their first 16 games to easily outdistance the rest of the competition, despite a late push by the Martinsburg and Hanover clubs the final two weeks of the season. The top batter and pitcher that first season both hailed from Frederick County, MD. Brunswick native, Bobbie Orrison, an outfielder for the Hustlers, led the league with a .341 batting average while his teammate, Bill King of Jefferson, MD, led the league with 17 wins. 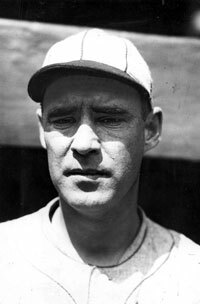 Outfielders George "Reggie" Rawlings and "Country" Morris of Martinsburg were among the best overall players in the league, and infielder Pete Bigler of Gettysburg was among the fastest with 38 stolen bases. Hagerstown featured infielders "Katsey" Dean and Johnnie Troy, while outfielder James "Bugs" Snyder led Chambersburg..
Welcher won eight games without a defeat, while King won ten straight games. Three no-hitters were thrown during the first season; all involving the Chambersburg Maroons. Chambersburg's Jay Bitters made his league debut a memorable one holding Hagerstown hitless with a 2-0 win. Frederick's Roger Peck tossed a disputed no-hitter against the Maroons in Chambersburg on June 10, according to the Public Opinion. Ed Stricker of Chambersburg tossed a no-hitter against Gettysburg on August 3. Home runs were not frequent during the first Blue Ridge League, as the entire league hit only 54. Four of the clubs hit a total of four home runs all season, mainly due to the fact they had no permanent fencing, so the outfielders could roam as far back as they wanted. Only Frederick and Martinsburg faired better, hitting 21 and 17 homers, respectively. Frederick's Barnhart led the league with six home runs. Home Runs were a rarity at Chambersburg's Wolf Field, that only one home run was hit there during the entire season. Among the highlights of that first year was an exhibition game between Mack's Philadelphia A's vs the Blue Ridge League champions, Frederick Hustlers at the end of the season on August 31 at Frederick's Agricultural Park. The A's won the game, 6-3 rallying for three runs in the ninth inning off Harry Llewellyn. Nap Lojie led Philadelphia with a double and home run, knocking in three runs. Overall, the Class D, Blue Ridge League was deemed a success in their first year. Mainly due to the fact that the area had already established baseball fans, and that Organized Ball was a refreshing novelty.